o hai Uncle Huai Bin! I iz like you cos i love the milky scent on babies too! hehe. Congrats on being an UNCLE! debbie: Alas! Did I ruin my player image? Haha! Ya, the milky scent is awesome eh? I’m sure she’ll grow up well but I kinda told her (not sure if she understands coz she’s like 2 months old?) that I’ll bring her clubbing when she’s 21. Haha! u will miss them more as they grew . . . The way you hold the baby damn poor thing lor. I dont think she’s comfortable. Ahahaha… Imma gonna call you Uncle Bin from now. 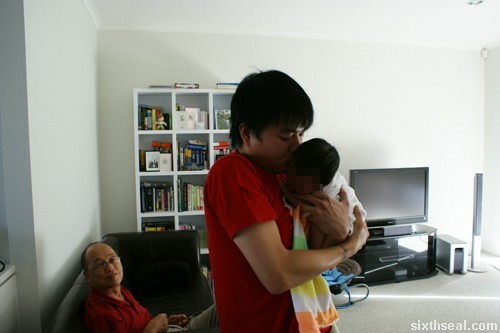 Awww….that is really sweet Uncle Huai Bin! Hahaha! uncle binny i’m far from a baby expert but why you hold her lidat one. hahaha! I was told to hold her liddat, support her rear and her head. This picha has great feeeeeeel! Congrats on becoming an Uncle. My dad is very happy about having a granddaughter. My parents dotes on her. Haha! Congrats! Ah…this is the good life. Enjoy! ahlost: Haha! Yeah they do look the same right? Aroused your paternal instincts, eh? Ok…settle down, get married…and make some of your own!!! Wink! Wink! LOL!!! SO cheap! So much to eat! What’s this about not bankrupting Genting? What’s going on here? Hey, babies have their own baby smell so that we adults feel compelled to take care of them, to protect them, to stay awake with them all night, to play with them and cuddle them all the time. It’s their own protective thing, and as they get older, they turn into normal smelly adults. So it’s nothing to do with incestuous breast milk, or whatever. rocket: Wrong guy la. Haha! I will bankrupt myself before I can beat the house. Thanks for the explaination – so it does have an evolutionary reason.